The American economy is hurting and taxpayers are suffering. People are walking away from their homes and credit card debt. When creditors write off a debt, they are required by law to issue the taxpayer/debtor a Form 1099-C, Cancellation of Debt. According to Internal Revenue Code section 61, income is taxable from whatever source it is derived. 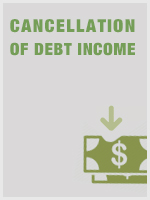 This includes the discharge of debt. It is unfortunate that many taxpayers and their representatives are unacquainted with IRC section 108 which excludes many of these discharges or cancellations of debt from taxable income. If their discharges or cancellations of debt are properly handled when their returns are filed (or even later), taxpayers can avoid paying tax at a time when they are least able to afford making such payments. This is a confusing area of the tax law, and many tax preparers are unaware of the IRS relief provisions that are available. Often it is not too late to ask the IRS for abatement or refund even if the normal statute of limitations has expired. Because this course focuses on an area that affects thousands of taxpayers, this class is a must for every practitioner who wants to avoid the rampant mistakes that are occurring in the application of this area of the law.